I’ve heard a lot of very good things about The Manhattan Projects, so I thought I’d head to my local library and see if they had the first volume. Luckily for me, they did! I’m fascinated by the concept of the book. As we all know, The Manhattan Project introduced the first atomic bomb. This book written by Jonathan Hickman with art by Nick Pitarra introduces the idea that the atomic bomb was just one of many, many projects the scientists were working on during that era. The concept is fascinating, I’ll grant you that. Furthermore, Hickman makes a bold move by actually using Oppenheimer, Einstein, Feynman, Fermi, Daghlian, Von Bruan, Groves, and FDR! These are historical figures from The Manhattan Project, some more famous than others, and Hickman uses them unabashedly. He’s got guts, I’ll give him that, especially because he paints none of them in an overtly positive light. The book itself is a fun read. It really gets into science fiction, which is nice since most graphic novels deal more with science fantasy. I’m not sure it struck me as being unlike anything else I’ve ever read, but it was definitely entertaining. Some of the major storylines running through this volume includes Oppenheimer’s evil twin brother working to usurp his place in life, Einstein trying to open an inter-dimensional door he created, FDR assimilating to AI, and Groves trying to get more and more weapons out of his scientists. As you can gather, this book has gusto. Pitarra’s artwork is adequate. It didn’t knock me off my chair, but it also didn’t negatively distract me. I think his style services the story well. He excels at details. There is a great deal of devices in The Manhattan Projects, and Pitarra renders each and every one of them intricately. 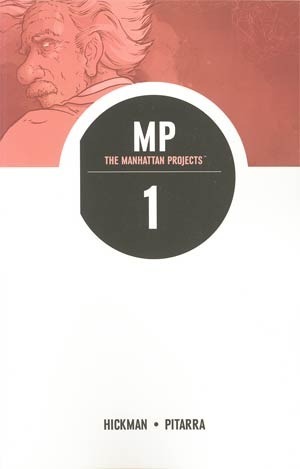 While The Manhattan Projects interested me, I’m not sure I’ll add it to my “must buy” list. If the other volumes become available at the library, however, I will certainly check them out. This entry was posted in Book Reviews and tagged Book Reviews, comic books, graphic novel, graphic novel review, image comics, jonathan hickman, nick pitarra, the manhattan projects.